Coach Gordon Strachan believes Scotland are due a "favourable" draw in Saturday's World Cup qualifying draw. The Scots are third seeds and will therefore avoid sides like Poland, Ukraine and Sweden when the draw is made in St Petersburg, Russia. In the last set of World qualifiers, Scotland finished fourth behind Belgium, Croatia and Serbia. 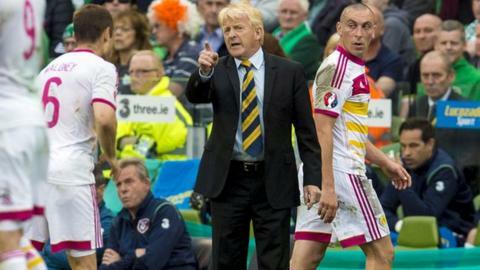 "There is no doubt qualifying for a World Cup finals is harder than ever," Strachan told the Scottish FA website. "There are so many good national teams across the continent vying for a limited number of places," he added. "It is certainly changed days from my time as an international player and I think we lose sight of that fact when we analyse recent disappointments. "I've never been one for hoping that we avoid this team or wishing that we draw that team. It's disrespectful to the other nations and it's also pointless - you can't control names that come out of a glass bowl. "What I would say is that, given the draws in recent campaigns we are due a favourable one." Strachan took over from Craig Levein during the qualification process for the 2014 World Cup in Brazil. Germany won that tournament and then opened their Euro 2018 qualifiers with a narrow 2-1 win over Scotland. However, Strachan's side are well placed in Group D with six rounds of games played and four remaining; sitting third, two points behind Germany and three off Poland. "From our own point of view, I don't think anyone would argue with the progress we have made so far in another tough group - in fact the toughest qualifying group in the European qualifiers," said Strachan. "We have already shown we can compete against the world champions, Germany, and while we have a few big challenges ahead the experience will stand our players in good stead. "I still firmly believe we can qualify and that we will qualify for the Euro 2016 finals in France and, more importantly, the players believe that, too. "When you look at the campaign for the World Cup in 2014, Croatia were top seeds and we managed to beat them twice, which shows that we are more than capable of upsetting those seeded above us. "The problem for us was that Belgium were third seeds behind Serbia, but by that point had blossomed into one of the best teams in Europe with the emergence of [Marouane] Fellaini, [Thibaut] Courtois, [Vincent] Kompany, [Eden] Hazard, [Christian] Benteke and [Romelu] Lukaku as top, top players. "Then there was Wales, who were supposedly the weakest team in the group as sixth seeds but who have since gone on a remarkable journey helped in no small part by having an inspirational world-class player in Gareth Bale. "The fact they are now a top seed is a credit to Chris Coleman and the work his players have done to improve." Strachan believes he has a squad of players keen to "better themselves, to achieve great things in their careers and, just as importantly, give our supporters the kind of experience they deserve". "I've said it before and I will say it again: World Cups and European Championship finals have been poorer as festivals of football for not having the Scotland supporters there and I know they are looking forward to returning as much as we are," the national coach added.